Antal Dorati conducts the London Symphony Orchestra for this unsurpassed performance of Russian composer extraordinaire Sergei Prokofiev's comic opera piece Love For Three Oranges Suite and his famed orchestral composition the Scythian Suite. This is one of the most desirable Mercury's both from a musical and a sonic standpoint! "...this one is highly recommended. It's limited to 2500 copies and it too will surely go out of print. Even if you know nothing about classical music or you're "scared" of it, turn the lights out and have a listen to this. It might "scare" you, but in ways you'll like!" - Michael Fremer, Music 9/10, Sound 9/10! 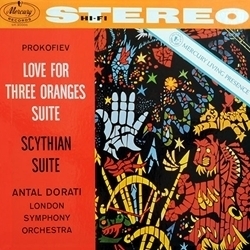 Antal Dorati conducts the London Symphony Orchestra for this unsurpassed performance of the Scythian Suite and Love For Three Oranges Suite by Prokofiev. Sergei Prokofiev was a Russian composer, pianist and conductor who mastered numerous musical genres and is regarded as one of the major composers of the 20th century. The Love for Three Oranges is among his best-known works. Prokofiev's first major success breaking out of the composer-pianist mould was with his purely orchestral Scythian Suite, compiled from music originally composed for a ballet commissioned by Sergei Diaghilev of the Ballets Russes. The conductor and composer Antal Doráti was one of the most distinguished musicians of the 20th century. Antal Doráti's recording activities commenced in 1936, his total number of recordings reached nearly 600. Many of them won international prices, amongst others 32 "Grand Prix". His influence in the musical world has been highly significant, not only as a conductor. He has an impressive number of compositions to his credit, which are performed worldwide more and more. His distinctions included the post of Honorary President of the Philharmonia Hungarica, four honorary doctor degrees, the rank of Chevalier of the order of Vasa of Sweden, the Cross of Honour, 1st class "Artibus et Litteris" of Austria, the order of "Chevalier des Arts et Lettres" de France and others. The Royal Academy of Music in London honoured Antal Doráti by appointing him an Hon.R.A.M. And in 1983 her Majesty the Queen appointed him an Hon. KBE(Knight of the British Empire) in recognition for his service to music in Britain. T]he ultimate in fidelity of these early stereo recordings from Mercury Living Presence. That’s the goal of ORG’s 45 rpm vinyl reissues. If you have a quality turntable system and the ability to play 45 rpm discs without a lot of bother... this set is the way to go... Ambience, snap and natural timbres of the instruments..." - John Sunier, www.audaud.com, 5 Stars!